Picks From THE PIT Times Infinity! Have you ever heard a conversation like this between students or even your own kids? "I know the names of 100 dinosaurs!" "Oh yeah! Well I know the names of infinity dinosaurs!" 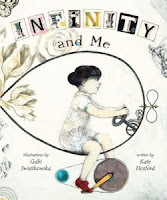 It was something like this that inspired Kate Hosford to write the book Infinity and Me, and let me tell you, I like it infinity times 100 + 1! Uma starts talking about her new red shoes that she is so excited about that she can't sleep. When she begins star gazing she wonders how many stars are up there and eventually goes to infinity which she thinks is a WAY bigger thing than she should be thinking about. She asks friends and family what they think of infinity and gets some wonderful, non-fiction type answers that make her think even more. Her friend Charlie relates infinity to numbers, her friend Samantha explains the symbol for infinite as a figure eight that fell over for a nap and Grandma says it's like family with great grandparents, grandparents, parents, children, grandchildren, great grandchildren and it could go on and on! If there is no school before recess, and no school after recess, is really recess? The school cook asks Uma if how many times she can cut a noodle in half and the music teacher compares it to a song that goes in circles with no end and no beginning! AWESOME! It's hard to find good literary non-fiction books to read out loud, but this one works infinitely well and the kids love it. The illustrations by Gabi Swiatkowska were recognized on the NY Times Best Illustrated Books of 2012 list and they are wonderful, unique and interesting enough that kids find new things to look at and discuss on every page. I'm adding this really smart book to my all time favorite books list! I look forward to this Saturday in February each year -- a gathering of colleagues from my district, from surrounding districts, and friends who travel quite a far way. This year, Laura Komos came from Illinois and Jennifer Orr and Dahlia Constantine came from Virginia -- that is some serious dedication to gathering with like-minded educators to improve what they do each and every day in their classrooms!!! I had the distinct pleasure of presenting twice this year. I love how the actual act of planning a presentation and then listening to the people with whom you present, actually make me a more thoughtful literacy teacher. The first session I presented with my blog partner, Bill. We both brought wonderful books that came out in 2012 and shared them. After four or five years of doing this together, we still enjoy this time we get to spend sharing great books of the past year with other educators. For those of you that couldn't be with us, but would like to see what made our booklist this year, check out this link. Then, in the second session I presented with Cathy Mere and Deb Frazier -- our session title was Using Evernote to Capture Literacy Learning. We focused on the power of the Evernote app to collect information about our students' learning journeys through the year. Cathy mentioned that, even with all we have learned, we have probably only scratched about 20% of Evernote's capabilities. Below is our slide show - feel free to look at it and also spend some time looking at the Weebly that Cathy has created to hold multiple Evernote resources - it is a treasure trove of information!! Getting to plan with Bill, Cathy, and Deb was incredible. In addition, listening to Ralph Fletcher, Louise Borden, and Vicki Vinton has given me much to ponder about the importance of mentor texts in writing, digging deep into topics of choice for research, and being very focused in my reading conferences with students to help them dig deeper with their comprehension. And finally, the Dublin Literacy Conference gives me an opportunity for face to face time with friends and colleagues from near and far. That is truly a gift I treasure. Cynthia Lord is Coming to Bailey! WOO HOO! It's been two years in the making, but the time is finally here! Newbery author Cynthia Lord is coming to visit the students and teachers of Bailey, March 12 & 13! I can't wait! 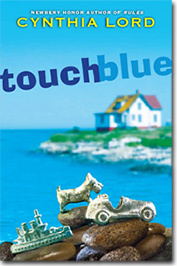 It all started two years ago with a Grand Discussion of her wonderful novel, Touch Blue. My friend and fabulous PTO author visit chair, Amy Proctor read the book and was so moved by it and the way it impacted her family that our discussions began about inviting Cynthia to our school. At the time we were in the midst of planning an visit from Kirby Larson, but it's never too early to start planning the next visit! Since the discussion was in November, we sort of tabled the thought, but, as my good friend Joyce says, both of us were percolating on the idea. In February 2011, Kirby Larson, one of the nicest people I've met, came for a memorable visit. During our two days together we discussed many things, Newbery winners, great kids' books, the life and times of an author, and what plans she had for Hattie in the just begun sequel. (Side note: I have it on reserve at the library, can't wait) The topic of Touch Blue came up and Amy shared why it had been such an important book for her family, so relevant at the time for them. When Kirby heard this, her immediate response was, "You must let Cynthia know how it touched you!" That night, Amy emailed Cynthia and a conversation began. The two of them traded emails and Amy asked if she could invite her. Of course I said yes and the rest is author visit history. Cynthia Lord is coming on March 12 & 13 and I can't wait!